Most of the woodwork was painted white. I’d love to see the “before” photos. There are 4 bedrooms and 3 baths in this nearly 5,000 square-foot house. “Sound, city & mountain views across the street from Volunteer Park.” Wow. Like what they’ve done with it? Asking price is $2.98 million. For more photos and information check the listing with Kim Knowles at Windermere. I’m normally not a fan of blue but I gotta say this home looks perfect to my eyes. In every way shape and form. Even the painted interior woodwork. Purists likely hate that it is painted but the raw wood can be so overwhelmingly dark. And that color exterior – blue but not too overwhelming a blue. Blue but not baby blue. Blue but not cold blue. I’d love to know what paint brand and color it is. Within the realtor’s listing link is a link for more photos of the house. I could live there. It’s beautiful! Just enough color inside and out to offset all the gray days. Stunning! They did a fantastic job with it. Interesting to see how they chose some woodwork to leave original and unpainted (like the stairs and fireplace) while much of the rest of it has been painted white. I’m surprised with the price, actually. If this was in Vancouver, it would be much more $$$. It’s crazy how expensive houses are in BC at the moment. The view is incredible and the millwork is beautiful. I love the architecture of this house. Interesting that this is being referred to as a Colonial with Craftsman touches. This strikes me most as Shingle Style. Whatever you call it, it’s absolutely gorgeous. I love every room in the place and that view! Just stunning! I think it might be a Colonial Revival, a style that was popular in the early part of the 20th Century. I just love it! Wow. That pop of orange is really pretty and not too overwhelming at all. Just lovely. I agree with 65andcounting. Blue is difficult to pull off, but this home is striking, that shade of blue is just beautiful. There is nothing I dont love about this house! I espeically love that they have painted much of the trim and woodwork white. Living in Seattle, it can get a little dark and dreary with all that rain so the white trim really makes the house pop and feel brighter and bigger Now, if I can just convince my hubby to paint our stained triim! Not a fan of all the painted woodwork. All I can think is how much warmer the home would feel with the natural wood. But, if it is truly grey a majority of the time then perhaps it works better this way. The structure and layout is beautiful. Really love all the windows. Beautiful. Not overdone at all. I do like that blue on the outside. I think it works because I’d see this house as more Dutch Colonial with a bit of Craftsman influence. It works well. Great job. Eeek on the price though. Still lovely. We can dream. So I was going to say that the way this house was renovated is not for me, with the too-open floor plan and all the white. Then I saw the view… I’ll take it!! Love the color and the details! I agree with an above poster that bare wood can be incredibly dark, so I even like the painted wood. 🙂 I’m not liking the radiators, but I know they can be tough to get rid of without having to drop the ceilings to get heating to all the rooms. (Oh well!) It’s a beautiful house! My favorite photo is of this room. I call dibs! Check out the view! Beautiful! Love this house. A few color changes and it’s perfect. I lived in the Seattle area for 20 years and oh how I miss it!! This house and the view and the trimmed boxwoods in the back yard are just dreeeeamy. The decor is so well done -just enough contrast and color to offset the crisp white trim. I’m a bit surprised by the price though…seems a little high. But if I had 3 mill to spend, this would be a contender. It’s nice to see this up on your blog today. Thank you for sharing it. I’m not a fan of painted wood, but I think the details throughout this home are well done. I especially love that kitchen. It’s one of the best ones I’ve seen in a Craftsman home. Oh I am loving this one! I don’t normally like Craftman style homes, but the white trim is beautiful throughout. I would imagine that people who appreciate the authentic Craftsman details would be upset that it was all painted, but it certainly brightens up the rooms. I can’t decide if I like the woodwork being painted white. On the one hand, it’s light and cheerful, but on the other hand, it’s not correct for the period. Still pretty though. I do like the kitchen, but not so much the TV area. TVs are most comfortably viewed when they are at or below eye level. Also, this one appears to be across from windows which is never good. I love almost everything about this house. 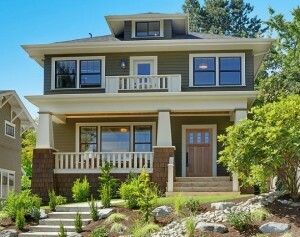 I’ve always had a warm spot in my heart for Craftsman style homes. I am having a tough time with the Dutch Colonial part. I don’t know why but I’ve never been a fan of the style. Wow Julia that is some beauty. I love everything about it. That kitchen oh my……thank you for sharing. Regards Esther from Sydney. This house is absolutely stunning. I love the freshness of the white painted woodwork and that they retained the radiator heating. Have you seen the houses on Grimm? This series is set in Portland, Oregon and the houses are stunning. I love the windows in the kitchen! Beautiful home. Love the built-ins and kitchen windows. This is my dream house – it is absolutely perfect!